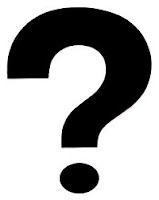 My last post was about why we ask questions and it was inspired by many of the tweets and interactions with #educoach participants and hosts, Jessica Johnson (@PrincipalJ), Shira Leibowitz (@shiraleibowitz), and Kathy Perret (@KathyPerret). Over the last few Wednesday nights, they have been leading twitter chats about High Impact Instruction, Jim Knight's most recently published book. One of the first questions that I had for Jim dealt with how many questions he would like to see teachers ask within the course of a lesson and his response to me was predictably that the answer depends on the type of lesson. Jim writes about the distinction between intensive-explicit questions and constructivist questions. Thinking back to my previous post about why teachers ask questions, the way that teachers should use these questioning techniques is dramatically different depending on the type of lesson that they are giving. Funny, how I would have said that these are open-ended questions until reading Jim Knight's chapter on Effective Questioning. The truth is that all of these question have finite responses and arguably, they even have right and wrong answers. I have tried to stay away from closed-ended questions, but in this case, I think that this lesson and these questions would provide an effective and engaging lesson. To answer my original question about how many questions this lesson would contain, I would think that it would contain at least four and probably more. How does this story contain these story elements? If I asked only this one question, I wonder how the students would manage. Would this one question be enough to keep them on task and engaged? I'm thinking that it would. It occurs to me that this is a powerful way to differentiate a lesson. If I were to take the constructivist approach, then my higher students could independently develop responses about the scene, characters, problem, and resolution. I could scaffold other students by taking a more intensive-explicit approach and guiding them through the questions. If anyone tries this lesson, I would love to hear about it. I would also love to hear about lessons that combine an intensive-explicit approach with constructivism. *I am not claiming ownership of this idea because I read it in an article that I read recently, written by, I believe, Jim Knight. A commercial served as the basis for an intensive-explicit lesson on the components of a story, but also as a constructivist lesson about what the creators of the commercial did do make it persuasive. With the availability of so much information via tweets, posts, wikis, books and articles, I can't remember where I read this idea so that I can properly reference it. If anyone knows, please share so that I can not only cite the source, but also give a shout out to creative ways of embedding media into lessons. My husband and daughters shook their heads at me when I told them that I am committing to a daily writing post for the month of March. When I tried to talk any of them into joining me, they shook their heads harder. All yours, Mom. So, why am I doing this challenge? I miss writing creatively. I have been doing a lot of writing but the information oriented genre has not been scratching my narrative itch. I will work hard to have my months of slices lean more toward the narrative genre. I learn about myself when I write. I remember events that I thought I had forgotten and I think about events more deeply than when they just happen. I study people in my world more when I am writing. I ask questions and notice more. Even though I feel like I am living in different worlds because I think about my narratives, I feel more present and aware of the world and the people around me. I listen and observe more carefully because I want to remember and re-create. Over the summer, I read Stephen Kings' book, On Writing, and I wrote every day. Then, the school year began and I abandoned my struggling character. I'm not planning on returning to Katy and her issues until the summer, but I am looking forward to exploring other territories for creative writing during the next month. So on to March 1st. 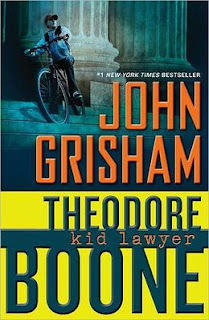 Last week, I wrote about how one of my students recommended the Theodore Boone series by John Grisham and I was hooked after reading the first book, Kid Lawyer! 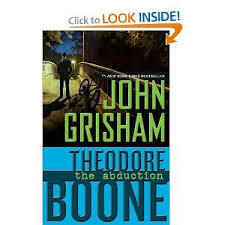 This past week, I read the next two books in the series: The Abuction and The Accused. I could not put either book down and can't wait for book 4, The Activist, to come out in May! 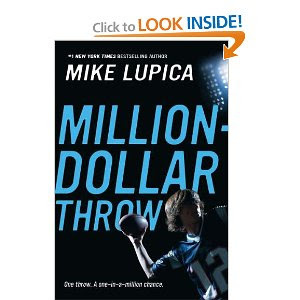 Before February Break, one of my students recommended The Million Dollar Throw by Mike Lupica to me so I added it to my TBR stack for the break this past week. I honestly am not a fan of sports, other than watching the Yankees of course, so this was definitely going out of my comfort zone to read a football based book. To my surprise, I loved the book! It is a heartwarming and inspirational story about a 13 year old boy, Nate Brodie, who is nicknamed "Brady" after his favorite quarterback. Nate is a quarterback on his football team and saves up to buy an autographed football signed by Brady. That autographed football leads him to the opportunity to try to win a million dollars in a throwing contest. The money is intriguing since his family is going through a difficult financial time and his best friend, Abby, is going blind and needs costly treatments. Both Abby and Nate are inspiring characters throughout the text and remind the reader that anything is possible when you put your mind to it and work hard to make your dreams come true. Thank you Steven and Shane for recommending Million Dollar Throw to me! So many of my book recommendations come from teachmentortexts.com, a website that links many bloggers and lets us all share what we have read over the week. 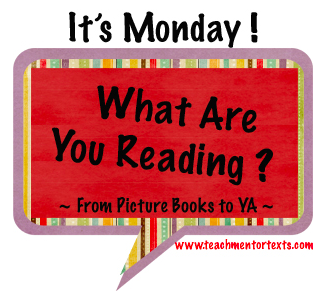 Jen and Kellee read an incredible amount of books and the rest of the bloggers who share books on Mondays keep my TBR pile high! To see what others are reading or to participate, follow the link to their blog. Thanks to Katherine Sokolowski for encouraging me to return to Will Grayson, Will Grayson by John Green because once I got through the first 50 pages, I was hooked. This book has a clever plot and some memorable characters with a speech from the main character that is one of the most memorable literary passages I have read recently. Definitely PG-13, though--read it before giving it to students. Thanks to Linda Baie for the recommendation of The Lonely Moose by John Segal. What a lovely story about friendship that could pair with The One and Only Ivan and inspire classroom conversations about the importance of loyalty and empathy. I picked up How To Catch an Elephant by Amy Schwartz because I was looking for a mentor text for our kindergarten How To Writing Unit. While it won't work as a mentor text for this unit, this book is hilarious and could work for teaching about voice and sound in writing. My tear-jerker for the week was Dad, Jackie, and Me by Myron Uhlberg and I highly recommend it as a historical fiction book and as a book for teaching about empathy, acceptance, assumptions, and prejudices. The narrator's deaf father connects with Jackie Robinson as a person who has experienced discrimination first-hand. This book could lead to great classroom discussions. 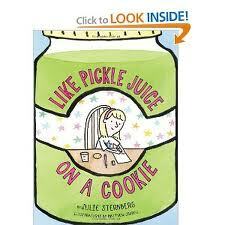 It's also a great mentor text for understatement and developing a setting. Grandpappy by Nancy Carlson is a lovely tribute to a grandparent and would be a powerful mentor text for focus and elaboration, as well as parallel structure and repetition. Although not a new book, this was one I missed and was glad to find. Being on vacation allowed me to read more than usual this week. These books were the highlights. Thoughts on Questions: So, Why Do You Ask? On Wednesday nights, I look forward to #educoach, a weekly twitterchat that is hosted by Jessica Johnson (@PrincipalJ), Shira Leibowitz (@shiraleibowitz), and Kathy Perret (@KathyPerret). For the last three weeks, these leaders have dedicated the hour to discussing Jim Knight's new book, High-Impact Instruction. While I have been interested in questioning and inquiry-based learning throughout my teaching (and parenting) career, this book and these discussions have inspired me to think more about the importance and power of questions in and out of the classroom. This is the first in a series that I will be writing about questions. Last year, as a Special Education teacher and this year, as a coach, I find myself as a guest in many classrooms and I pay attention to the questions posed during lessons and conferences. I have paid attention to open/closed questions, rates of questioning, who answers questions, and how successfully questions engage learners. One teacher asked me to keep data on whether she called on boys or girls more frequently. Another teacher wanted me to pay attention to who spoke more in a conference and it related directly to her questioning techniques. Every chapter of High-Impact Learning has been high-impact reading for me, and the chapter on Effective Questions is no exception. While I know that I have thought about the reasons for questions before, I don't know that I have ever really, really analyzed the reasons for questions and I think that knowing why we ask questions leads to powerful instruction. So, why do you ask??? Which is the numerator, the top or the bottom number? What are the parts of an introduction? If they are open-ended, these questions still have an expected correct answer--teacher knows the answer and is making sure that the students do, as well. What are some thinking stems? How can we tell that a fraction is greater than one? What were some of the reasons for the Revolutionary War? When a teacher uses a "turn and talk" strategy, I love to see questions that inspire students to want to have a conversation and share their thinking. Why do you think the character behaved in a certain way? What do you think will happen during this experiment? How have you used a specific strategy that we have learned in the classroom? What generalizations are you able to make based on your results? I am sure that there are other reasons for asking questions. We can draw attention to what we want to have done (Clare, did you make your bed? ), we can gain necessary information (Where do we find the best pizza in town?) or we can orient ourselves for necessary next steps (what was the last step you completed in this recipe?). Within a classroom setting, I will be paying more explicit attention as to why we ask questions and I would welcome thoughts and comments about this. 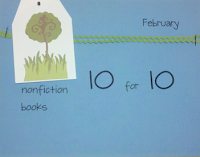 Thank you Cathy Mere (Reflect & Refine), Julie Balen (Write at the Edge), and Mandy Robek (Enjoy and Embrace Learning) for hosting this Nonfiction Book 10 for 10 Event (#nf10for10)! Cathy and Mandy have hosted the Annual Picture Book 10 for 10 Event for the past three years and this is their first Nonfiction Event. Please check out their blogs to read about everyone's favorite nonfiction books! 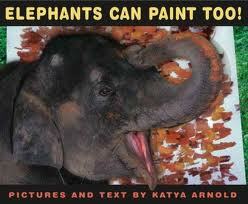 Elephants Can Paint Too! by Katya Arnold is always a favorite in our classroom. I love how one side of the page tells a narrative story about elephants painting, while the other side of the page gives interesting facts about elephants. 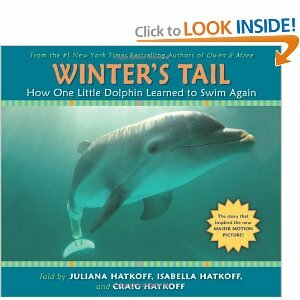 It is a great example of a hybrid nonfiction text that includes narrative and expository structures. The facts about elephants in this text are amazing and you are guaranteed to learn new information about elephants that you never knew! Oh, Rats! by Albert Marrin and C.B. 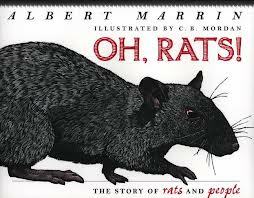 Mordan is a fascinating text about rats that is written in a multi-genre format. There are various passages in this text that range from narrative to expository formats and the points of view vary also. It is a great text to use when teaching students different forms of note-taking and how to decide which form to use for different texts. For example, some passages compare two different rats so it would be a great passage to use to model using a venn diagram or t-chart for note-taking. It is also a perfect mentor to use during writing workshop throughout the year for different purposes and students love to hear about rats! Should There be Zoos? By Tony Stead is my all-time favorite nonfiction and persuasive text to read aloud to students during the nonfiction unit. The arguments for and against zoos are research based and alternate throughout the text. The students love stating their opinion about zoos at the beginning and then revising after learning more about the research behind each argument. We also have debates to share our opinions and beliefs while reading and discussing the text. This is also a perfect text to use as a mentor during writing workshop for argumentative research-based writing! Winter's Tail: How One Little Dolphin Learned to Swim Again by Juliana Hatkoff, Isabella Hatkoff and Craig Hatkoff is a powerful and inspirational nonfiction text. A couple years ago, one of my students chose to research Winter during our nonfiction unit and she shared her learning with the class. We were all very interested in the topic so we read the book and also watch parts of the movie too - kids loved it! It has been a class favorite ever since! I love all of the Hatkoff's books such as Owen & Mzee and Knut - they are all must reads! Nubs: The True Story of a Mutt, a Marine, and a Miracle by Brian Dennis and Kirby Larson and Mary Nethery is an inspiring true story that is a must read! Last year, my class awarded this book as the Best Nonfiction Book of the Year for our class awards at the end of the year - they loved it! 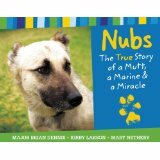 This years class equally loved it and were all very inspired and touched by this story about Nubs, an Iraqi dog of war who never gave up on making his home with the Marine Major Brian Dennis. 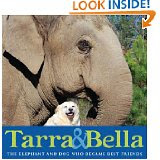 Tarra and Bella: The Elephant and Dog Who Became Best Friends by Carol Buckley is a powerful narrative nonfiction text! Tarra, an elephant, becomes best friends with Bella, a stray dog. Even though they are complete opposites in more ways than just size, they form a close friendship that is inseparable no matter what happens. 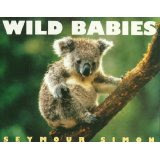 All of Seymour Simon's nonfiction books are amazing! One of my many favorites of his is Wild Babies. Each double page spread focuses on a different animal from elephants to opossums to kangaroos and so on. It is a perfect book to teach how to use boxes and bullets for note-taking, summarizing, and determining importance. I use this text constantly throughout the year for mini lessons in both reading and writing workshop. I love all of Melissa Stewart's nonfiction books! Shark or Dolphin? How Do You Know? is one of the many titles in her "How Do You Know?" series that includes topics such as: Butterfly or Moth? ; Frog or Toad?. 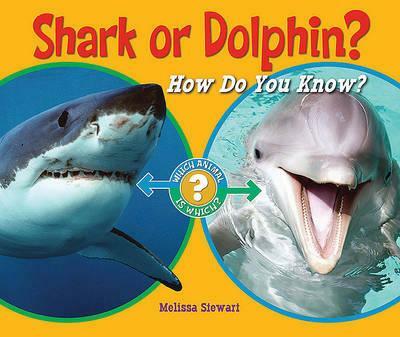 This series is perfect for teaching students how to read nonfiction texts written in a comparison structure and are also great to model note-taking strategies, such as a T-chart or venn diagram. I also love her book, National Geographic Readers: Deadliest Animals. It engages the reader right in the introduction with the surprising fact that the African Lion is not actually the deadliest animal and there are many surprising deadly animals. 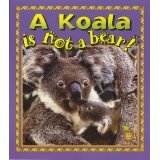 I love all of Bobbi Kalman's nonfiction books and one of my favorites is A Koala is not a Bear. It is full of colorful photos, labeled diagrams, headings, boxed information, bold words, sections, maps, and more. It is a great text to teach how to take notes using boxes and bullets and also comparison forms such as venn diagrams and t-charts. 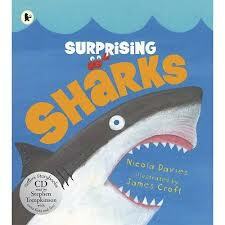 I recommend all of Nicola Davies' nonfiction books - they are all amazing! Surprising Sharks and One Tiny Turtle are two of my favorites. They are both great examples of hybrid nonfiction by including narrative and expository structures and features. Surprising Sharks is full of colorful illustrations, labeled diagrams, and compelling facts that will captivate readers. It is full of surprising facts that end up proving at the end that sharks should probably be more afraid of humans than we should be of them. I also love the Sports Illustrated Kids: Game Day series by Clay Latimer. My favorite book in the series is VIP Pass to a Pro Baseball Game! I am a baseball fan (Yankees, of course!) 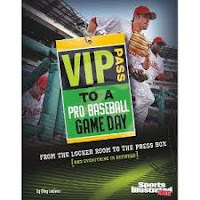 so I enjoyed reading about the "behind the scenes" action that we don't see watching the games - the pre-game and post-game action. I learned many new facts about the umpires, coaches, and groundskeeper along with information about the bullpen, dugout, and the clubhouse. This is a favorite series in our classroom this year! I am always looking for mentor texts to use for informational writing and this is a perfect series to use to study craft in informational writing. There are many, many more nonfiction books that are my favorites and wish I could have added them to this list (as it is, I may have snuck in an extra for good luck! ). Seymour Simon, Nicola Davies, Melissa Stewart, Bobbi Kalman, and the Hatkoff's are some of my favorite go-to authors when I am seeking out nonfiction texts - I highly recommend all their books! I read many posts about Hattie Big Sky by Kirby Larson over the last few months since many bloggers were anticipating the release of the sequel which was released last week. I loved getting to know Hattie and the rest of the characters in Montana and I definitely wanted to hear more about this brave and resilient young woman. Hattie Big Sky would be a great book to use for teaching about character, for studying strong woman heroines, or for reading in conjunction with a Social Studies unit on westward expansion. Hattie Ever After is definitely on my TBR list as I can't wait to hear how Hattie finds success and belonging. I also read Each Kindness by Jacqueline Woodson and if you haven't read it, I highly recommend it. Melanie Swider wrote about it here. What a special book! I came home and ordered it that same day. Rounding out this post with some humor, is Dragons Love Tacos by Adam Rubin. This one had been on my list for a while through some IMWAYR posts and I got my hands on it while I was browsing the bookstore. I enjoyed Dragons Love Tacos, not only for the humor, but also as a mentor text for focus and voice and a great read for practicing prediction. If you live anywhere near CT, you spent last weekend (and this week) digging out from the blizzard like I did. As I walked out to my parking lot last Sunday and saw my car completely buried in the snow, I immediately felt overwhelmed and did not even know where or how to begin digging it out. After someone created a path to my car for me, using a snow blower, I felt like the task was more manageable and that I actually would be able to get my car out. With a shovel in my hands and the help from a neighbor, we were able to remove enough snow for me to drive my car out of my igloo parking space. Then the removal of snow began - layer by layer. As we removed each layer of snow, using shovels and brushes, my car became more visible and I felt both a sense of relief and accomplishment. In the end, I achieved my goal and gained new learning from the experience and the process. During this snow removal process, I was reminded of the skills and strategies readers use when they read closely and interpret texts. Just as I felt overwhelmed at the onset of seeing my car, readers sometimes feel overwhelmed when they get ready to read a complex text. Just like I had the support from a neighbor who created the path for me, it is important for us to model and explicitly teach close reading strategies to students so they have the support they need to apply them independently. Readers will need different levels of support, just like I needed additional support by my neighbor. He helped coach me through the process and helped me as much as I needed at the time. This is similar to the coaching work we do during conferences and small group instruction. It is also similar to how reading partnerships support one another during reading workshop. Removing the snow layer by layer, reminds me of how we teach students to pull back the layers of the text and dig deeper each time they reread to lift the level of their interpretation. I have used the analogy of peeling an onion in my classroom and how you peel the layers of the text to reveal the deeper meaning just like the onion is revealed after peeling back the layers of skin. Now I have the analogy of removing the layers of snow off my car to help students visualize the work readers do when reading closely. When reading closely, readers develop new and revised thinking that they did not have after their initial reading of the text. They also see the text through a different lens and may have different emotions and/or point of view of the text. When I first saw my snow situation, I felt overwhelmed, frustrated, and defeated. When my car was snow free after getting help from my neighbor, I felt successful, relieved, and grateful. Taking the layers of snow off my car was no easy feat, but I had the tools and support I needed to be successful. We need to make sure we are equipping our students with the tools and support they need to feel and be successful. This is the fourth post in a series about increasing volume for young writers (or any writers!). To read the original post, follow this link. For the other posts about volume, please search our blog for volume and you will find them. One of the most important lessons for young fiction writers and readers is that writers use many techniques to build tension in stories. Multiple efforts at solving a problem is one way to build tension. For example, Clare wants to catch a fish. The first cast brings in seaweed, the second cast gets tangled in her fathers line, and the third cast hooks a fish. Simple formula. Clare has been wanting to catch a fish for a long time. Everyone else has caught a fish. She had a dream about catching a fish and she has already envisioned the whole family sitting around the dinner table for a fresh fish fry. Clare has been waiting all day to go fishing and they are FINALLY throwing a cast. Clare's dad has spent a lot of time and money teaching her to fish and outfitting her with equipment. The rest of Clare's family is planning on fresh fish. Dad has announced that he will eat the fish raw if Clare catches a fish. A storm is coming in and there is a sense of urgency to get away from the water. Clare's younger sister is seasick and Mom has declared that this is the absolute last cast. No one is catching fish anywhere nearby. All of these scenarios have the potential to create tension and very different stories about catching a fish. Applying them to other story-lines works as well; scoring a soccer goal, winning a race, learning spelling words, remembering homework, losing a dog, jumping off the diving board or arguing with a sibling are all common stories for young writers and have the potential to become different stories depending on techniques used for increasing tension. How fun for some writers to realize that they can develop the same problem and resolution with so many different sources of tension! I am off to write about Clare's fish! 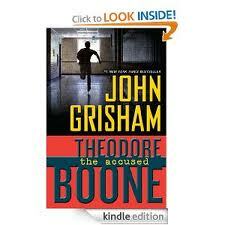 One of my students this year loves the Theodore Boone series by John Grisham and recommended it to me last week. He is an avid reader and I highly value his recommendations so I took Theodore Boone: Kid Lawyer, the first book in the series, home with me over the weekend and devoured it! I sat in my favorite chair and did not put the book down because the mystery hooked me right in and I couldn't wait to find out what happened next. If you haven't picked up this series yet, like I hadn't, I highly recommend that you add it to the top of your TBR stack. 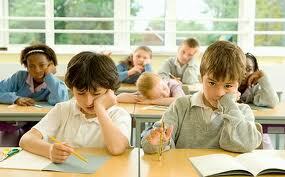 I have been snowed in this weekend, like everyone else in my area, and book 2 and 3 are in my classroom...ugh! So I've had to be patient and wait...but we have no school again so I will have to either continue to wait or take a trip to a nearby bookstore today to find out what happens next with Theo! Thank you Ryan for recommending this series to me! One professional book that I read this past weekend and loved was Student Centered Coaching: A Guide for K-8 Coaches and Principals by Diane Sweeney. I loved her book Learning Along the Way which I read years ago so I was very excited to see that she published a new book. This is an excellent resource for all coaches and principals and I highly recommend it. It is an easy read that gives you practical ideas of how you can make coaching more student centered, which I love! It includes coaching scenarios, coaching tools and techniques, and visual planning charts used in coaching cycles. 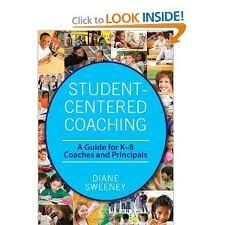 Thank you Diane Sweeney for writing another great resource for coaches! So many of my book recommendations come from teachmentortexts.com, a website that links many bloggers and lets us all share what we have read over the week. I appreciate our hosts, Jen and Kellee for all of their recommendations and this great Monday tradition! Nothing like a snowstorm to encourage some good reading and I enjoyed several books during the time that we were all housebound. I had two favorites. Navigating Early is one of my new favorite all-time reads and I don't think I can recommend it highly enough. 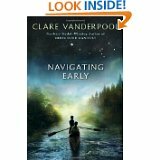 My only hesitation is that, like Clare Vanderpool's first book, Moon Over Manifest, Navigating Early is complex and contains parallel stories. Most elementary students will need some support to really understand and appreciate this great book so it would be a wonderful read aloud for upper elementary students. Set during the 1940's, this book has messages of friendship, loyalty, empathy, and perseverance, while complex characters emerge throughout the main characters' quests and offer lessons of connectedness. Early, one of the main characters, is odd (probably autistic by today's standards) but shows Jack that things aren't always how they seem and that sometimes answers exist in places where you don't expect them. I read this book in a day and I miss Jack and Early. I have returned to the pages to mark places where Clare Vanderpool writes so beautifully that I want to share it with other teachers and students. I'm not sure that I've read a better mentor text for meaningfully appealing to the senses or having characters develop quickly and authentically. Because I am working on a globally oriented curriculum, I have been reading fiction and non-fiction books that teach about various countries and continents. 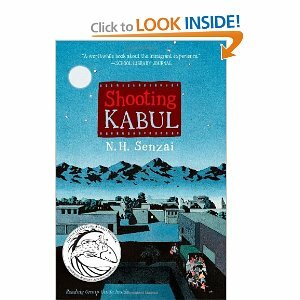 Shooting Kabul by N.H. Senzai is a beautifully written historical fiction book about an Afghani family's escape from their country and immigration to California during the weeks leading up to and just after 9/11 and I think that it would be a great book to include within a unit about Afghanistan and Pakistan. N.H. Senzai weaves in important geographical information and facts about the Taliban throughout this book, as well as messages of empathy, kindness, loyalty, responsibility and perseverance. My daughters laughed at me as I finished this book since tears were streaming down my face; they are lined up to read it (and we have ANOTHER snow day tomorrow) and I can't wait to talk about it with them. Laugh With the Moon was a recommendation from Melanie Swider and she reviewed it here on our blog. This is a book that I am excited to match with the Social Studies unit about Africa. If anyone has more historical fiction or non-fiction recommendations that would support our unit that have to do with China, Central America, Africa or the Middle East, I would welcome ideas! I have some professional books and twitterchats to catch up with tomorrow, as well as a few other books that I brought home from the library. I'm looking forward to school on Tuesday, though, I have to say! Please, no more snow! Mentor texts are extremely important tools for writers of every age and stage. While my last few posts have been about increasing the volume of student writing since I feel strongly that writers improve their writing by writing, writers also improve their writing by reading. Therefore, the more that we can inspire our students to read like writers and study the craft of whatever they are reading, the more skills will develop. The classroom teacher and I circulated and all of the signees had definitely tried out dialogue or feelings as strategies for ending stories. At one point, we had to suggest that students keep writing and come to the chart when there wasn't a line! One boy got to sign twice for one story since he had written: I said, I feel happy. One of the Common Core standards is that kindergartners "respond to questions and suggestions from peers and add details to strengthen writing as needed." (W.K.5) Using this sort of an interactive chart not only inspires young writers to return to their previously written pieces, but also to begin to read as writers, an important step in the development of close reading of text. Think about K.RL.10 which states that kindergarten students will "actively engage in group reading activities with purpose and understanding." I can't wait to hear about what this class adds to the chart, since I left room for them to add other ways that writers can end stories as they continue to read new books. Mentor texts and interactive charts combine in any grade for powerful experimentation and learning! This post is another in a series about increasing the volume of student writing. I believe strongly that students become better writers by writing. Coaching and instruction are critical as well, but student learning and improvement won't happen if words aren't appearing across the pages. In my original post about increasing the volume of student writing, I bulleted several ways to increase volume. In another post, I expounded on one of the bullets that had to do with quickening the planning process. In this post, I will write more about how we can help students find stories within stories. Most of us know about the watermelon and seed metaphor in that a single vacation serves as a watermelon and within that vacation, many stories exist which a the metaphorical seeds. But how do we convince students that their story, beginning with the beginning of the airplane ride and culminating with being back home in bed would be easier to write and more engaging for readers as a series of five, maybe ten, maybe twenty stories? I met with an enthusiastic second-grade writer last week. She was working on the story of how she got a pet. Her story began with going to the pet store, having a bunch of pets escape from cages, helping the shop owner capture creatures, and walking out with a pet in her bag. Good story, right? Molly the storyteller had more though. Her story was continuing though with getting home, having her mother discover the new furry resident, negotiating to keep the pet, but coming up short in the negotiations and having to return to the pet shop. Then, Molly kept going, this girl would get a job at the pet store and work really hard to convince her mom that she was responsible enough to have a pet. Finally, she would get to bring home one of the newly arrived kittens. I wish I could think of stories the way that Molly can! Fortunately, Molly had just been part of my lesson about planning ( you can read about that lesson here) and had used a story mountain to plan. The last point of her story mountain was when she walked out of the pet store with a gerbil in her bag. My compliment to her--and I REALLY meant it! !-- was that she had created tension and had an ending that responded to my favorite question for writers: what is your story really about? She wanted something and she got it. Molly was surprised to hear that stories could end without knowing that resolutions are permanent. With some coaching, Molly developed three more story mountains and realized that she could think of each one as a separate piece for the time being. That way, she could work on strategies that would improve the level of her writing without feeling overwhelmed by the size of the piece. I don't think that the multiple-stories-in-one-piece syndrome is unusual. Characters forget backpacks, return to school, get locked in the school, roam hallways, scare custodians, hide from noises and finally get rescued all in one story. What I have found to work for this syndrome is honoring the writers and celebrating all the stories that they have in their repertoire as writers. With that compliment, I have found that most young writers become excited about the prospect of harvesting so many stories and focusing on one at a time. Recently, I wrote a post about increasing the volume of student writing and I included several bullets with specific ideas for encouraging and facilitating students to write more. With most (arguably all) skills, the more that you practice, the easier they become; I strongly consider writing to be in this category so it's no wonder that the gap between proficient and fluent writers grows for the simple reason that fluent writers write more. Therefore, my next few posts are going to expound on some of the bulleted ideas. The children timed me as I sketched the pictures for my story of learning to ride a wave at the beach and they were amazed that my four pictures took me less than 2 minutes. My point to them was that the picture was less important to me as the fact that it would help me to write my story. I also really wanted them to realize that each picture in the foursome was important and was inspiring me to write. 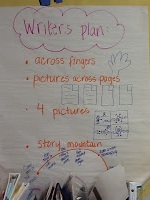 When I modeled the planning method of the story map as shown on the bottom of the chart, the classroom teacher asked the students about why I was not writing in complete sentences. One of the students responded that the mountain was only there to help me write the story I was planning. Exactly. Please don't misunderstand me. I value the planning process. However, I think that sometimes students who don't enjoy writing avoid writing with planning. When their plans have more on the page than their writing pieces, a problem exists. (And, yes, I have seen this...) I think that an important lesson for developing writers, especially fluent writers, is that some pieces require more planning than others. For example, when Jarrett Krosoczka, the author of Lunch Lady books, spoke to students at our school, he described his meticulous and thorough planning process. Additionally, when students are developing pieces that involve research, I think that it is helpful to sort through the research and categorize it; this sorting and categorizing is absolutely part of the planning process. But, nothing teaches writing better than writing. How to make sure that the story really does end with the last picture,page, or point on the story mountain-I loved listening to the children hit that point and then get their story going! That revisions can occur even in the planning phase and sometimes those are the most powerful revision moves. Young writers (okay, old writers, too...) become attached to their writing quickly but when they (okay, we...) know that we have only invested a small amount of time and energy in the developing piece, they are more receptive and agreeable to rethinking a piece. I have a page in my notebook that I am including here: These pages show young writers how I drew different story mountains, but revised them based on what I realized I really wanted to write about. So, I would love to hear about how other teachers are having students plan in their writing workshops. How much scaffolding do you give? How much time do you expect planning to take? How do you teach and challenge students to revise their plans? 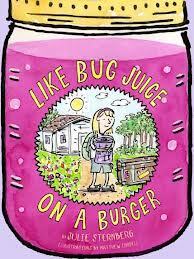 couldn't wait to read Like Bug Juice on a Burger via NetGalley! 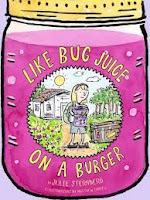 Like Bug Juice on a Burger will be published at the beginning of April so I was extremely grateful that I was able to read it early. I am now a fan of this series - it is adorable and humorous! If you haven't read the first book, Like Pickle Juice on a Cookie, I highly recommend that you add it to your TBR along with Like Bug Juice on a Burger that will be out in April! 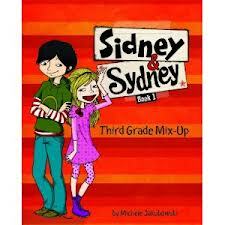 I also read Third Grade Mix-Up (Sidney & Sydney) by Michele Jakubowski and Luisa Montalto which was just published on February 1st! It is a very cute story about a girl named Sydney and a new boy in town named Sidney. They meet each other on the first day of school in third grade and there are many adventures from that day on in this book. This book is great for kids in third grade and up and will also be a series for middle grade reluctant readers too. I'm looking forward to book 2! Recently, I read some reviews about Genie Wishes by Elisabeth Dahl so I was excited to get the opportunity to read it early via NetGalley - it will be published April 2nd. This book is about a fifth grade girl named Genie who is facing common friendship challenges that most fifth grade girls face at her age. She has also been given the opportunity to be the student blogger for their class blog - I love how this book weaves in technology and blogs in classrooms! 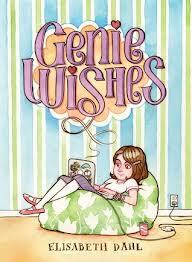 Throughout the book, Genie writes blog posts and always includes one wish at the end of each post. This is Elisabeth Dahl's first book, but I am hoping that this will become a series about Genie!